Casa Munfrà, recently renovated to offer the highest levels of comfort, has a large and luminous space, that can be modulated to any type of setting. The Meeting Room, comfortable and functional, is ideal for hosting business presentations, training courses, workshops and more select meetings and encounters. At Casa Munfrà, the versatility of the spaces, the cutting-edge multimedia equipment and the incomparable natural scenery amidst the hills of Monferrato, contribute to the success of each event. For reservations and information you can directly contact Relais Sant'Uffizio. The staff dedicated to meetings and events will be happy to answer your questions and fix an appointment. The Quercia meeting room measures 85 square meters and features a beamed ceiling and elegant furnishings that reflect the building’s monastic past. Impress your clients and colleagues by organizing your next business event in this room at Relais Sant'Uffizio. The Pianoforte room is adjacent to the Sala Quercia and can provide extra space for events. This is a smaller room, which lends itself better to private meetings or as an administrative support office. It is also perfect for workshops and group work sessions. 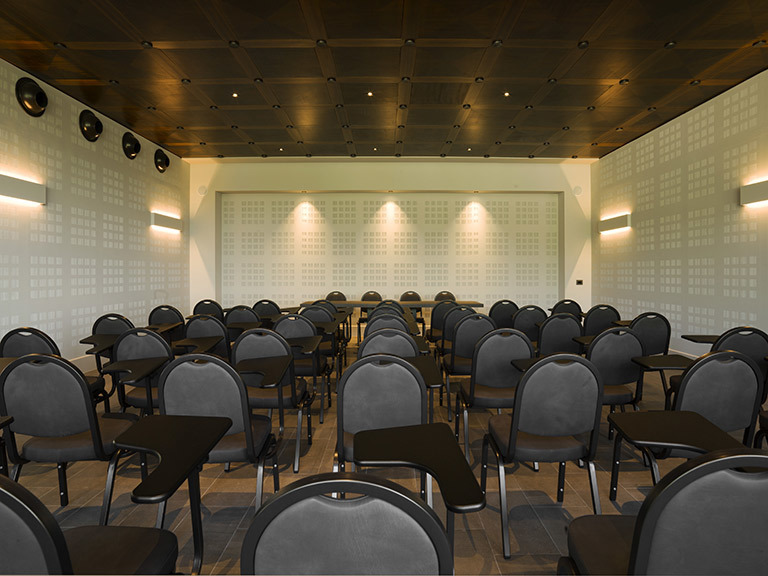 The Glicine conference room is the most suitable room for conferences: an open space of about 300 square meters that can be adapted to any occasion. Equipped with the latest technology and furnished to offer maximum comfort, this room is the ideal venue for large events with many participants. The Parco room is particularly appreciated for its abundant natural light, which makes it the ideal room for workshops and product presentations. It can accommodate up to 30 people and can be used as a meeting room or for smaller business events. Munfrà by Sant’Uffizio was recently renovated to the highest standards, our hotel and suite complex offers traditional architecture with modern furnishings and state-of-the-art technology. Relais Sant'Uffizio is the ideal destination for training and team building activities, both indoors and outdoors. Among the numerous opportunities that the structure offers are the exclusive Aquanatura Wellness & Spa center, a tennis court, the possibility of organizing games and competitions in the hotel parklands and many activities such as wine tastings, cooking lessons, truffle hunting and much more.